Artist's illustration of China's planned space station, which the nation aims to have up and running by 2022. China is working with the United Nations to help arrange scientific experiments aboard that country's space station. 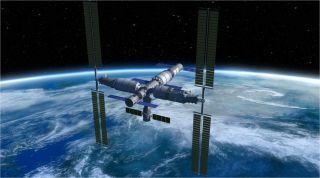 The United Nations Office for Outer Space Affairs (UNOOSA) and China's Manned Space Agency have invited applications from UN member states to conduct experiments on China's space station (CSS). The "announcement of opportunity" and application instructions for this initiative were released at a ceremony hosted by UNOOSA and the Permanent Mission of China to the United Nations and Other International Organizations in Vienna on Monday (May 28). "promote increased awareness among United Nations Member States of the benefits of utilizing human space technology and its applications." "This is space diplomacy in action," UNOOSA Director Simonetta Di Pippo said in the statement. "I appreciate China's partnership and support on this exciting initiative, and look forward to seeing a number of interesting applications from United Nations member states." "The China Space Station belongs not only to China, but also to the world," added Ambassador Shi Zhongjun, representative of China to the United Nations and other International Organizations in Vienna. "Just as the Outer Space Treaty of 1967 proclaimed, the exploration and use of outer space shall be a common province for humankind," Shi added. "Outer space should become a new domain for promoting the common interests of everyone, rather than a new battlefield for competition and confrontation." There are three possibilities for orbital experiments in the first round of opportunities, according to the UN press statement. Participants can conduct experiments inside or outside the CSS using payloads they develop, or they can perform experiments inside the station using facilities provided by China. Public and private organizations including institutes, universities and companies can apply for the opportunity; the deadline is Aug. 31, 2018. Institutions from developing countries are particularly encouraged to apply, UN officials said.